After parsley, rosemary, basil and thyme, sage is the next more popular herb that is a culinary favorite and its health benefits. For centuries, sage or salvia officinalis (which means ‘to save’), is regarded for its medicinal benefit and culinary uses. Member of the mint family of plants, sage is closely related to rosemary thus, almost all of rosemary’s health and culinary benefits can also be found in sage. Being a member of the mint family of plants, sage emits warm and musky fragrance that are best in dressing turkey. 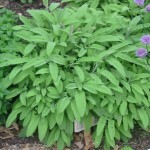 Sage is native in the Mediterranean and the Balkan regions. Some of the best known types of sage are common sage, garden sage, golden sage, kitchen sage, pineapple sage, true sage, culinary sage, dalmatian sage, and broadleaf sage. 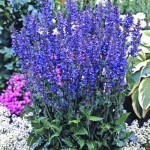 With its ability for medicinal benefit, sage was given a special ceremony by the Greeks and the Romans. Arabs believed that eating sage will grant immortality. Early Europeans used sage to ward off witchcraft. 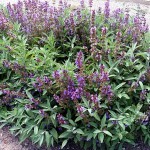 Sage has gray-green edible leaves and its flowers are blue, purple, white and pink. 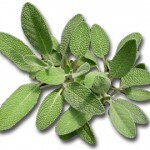 In the older times, sage medicinal use range from curing gastrointestinal discomfort to helping ease mental disorders. Sage is a natural antiseptic. It has a natural bacteria-killing abilities in meat. Used in muscle aches, rheumatism and aromatherapy. Sage’s volatile oils contain phenolic flavonoids apigenin, luteolin, diosmetin, rosemarinic acid, ketones, a-B thujone which helps to enhance memory and mental clarity. Sage is useful in treating patients suffering from Alzheimer’s. Sage also help to ease depression. Sage has compounds that fight inflammation, asthma and atherosclerosis. This herb is rich in Vitamin K.
Sage is a great source of Vitamin A, Vitamin B, Vitamin C, Vitamin E, folate, copper, calcium, iron, magnesium, manganese, folic acid, thiamin, pyridoxine and riboflavin. Sage helps protect body’s cells from damage caused by free radicals. Lower blood sugar and cholesterol perfect for the diabetics. Strengthens our body’s immune system. Sage is antifungal and antimicrobial. Sage is use to cure some skin conditions like eczema, psoriasis and acne.